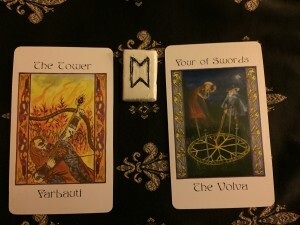 Today’s Draw: Farbauti/The Tower; Stan; The Volva/Four of Swords. 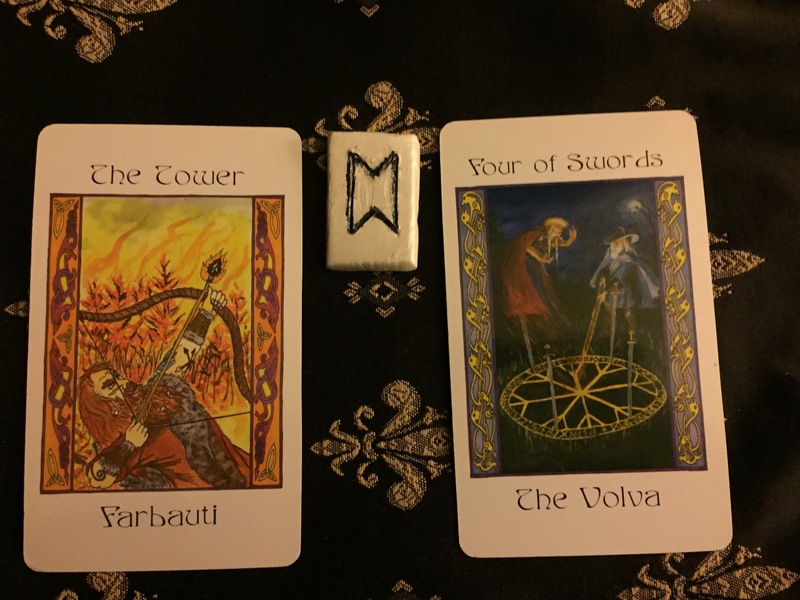 In case Hela’s message yesterday wasn’t clear enough for you, today Farbauti appears in the Tower card. You cannot remain in the burning rubble; you must move on. Nothing remains to take with you. Leave the ashes to cool, and walk away. Stan is a stone, sometimes seen as the keystone or capstone. However, since the Tower has fallen, the keystone is simply another piece of rubble. Let go of old thinking and beliefs. Living in an in-between state can be difficult; without the anchor of “I think” or “I believe”, we struggle to define ourselves and to move through the day. Being truly open to the new ideas which come through in the new circumstances is your best path for making your way through this transition. The old answers will not work–those keys do not fit any of the locks in the treasure chest, and you must find new ideas and new keys. The process may seem scary, so find a new way to view it to make it an adventure of discovery, rather than simply an ordeal to endure. You do not have to suffer over your suffering; instead, take that energy and transform it into new power to meet the challenges.